My year 2012 was a capricios year with several up's and down's and has begun with many appointsments with the physio to get my shoulder mobile again. beside i worked a lot on my basics, to do everythng possible for my physical fitness. 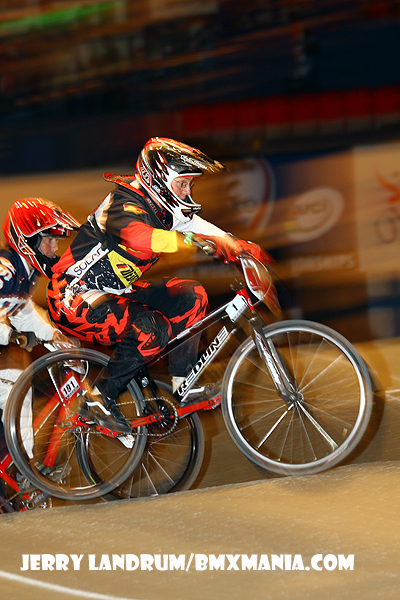 A rude awakening come with the first race in Italy on the BMX-track. While everything felt ok at home, i realized i still had a big lack in arm-power for acceleration. What followed was even more intensive training to minimize that deficiency. Finally the season has started on national level with the first Bundesliga-weekend. I was surprised in a positive manner how good it worked for me. Amazing gut regarding that just one week before i got a cut in my hand, very useless ! Luckily it didn't disturb my riding, since the sutures were already removed. Then i went in good cheer to the german championships to Kornwestheim, which is close by to our home. That was the first time that i could sleep at home at the GC, somehow strange, but really nice ! I might have done that at Bremen in 2000, too. But i didn't because as organizer i wanted to be at the venue. Since there was a new schedule for the GC, i had to race my 20" on saturday, and i felt better from one round to the next. Fifth place in the Men's 40+ was by far more than i had hoped for. Sunday was Cruiser-day, and we got wind, partly very strong wind. The worst came just in time for the main finals, and right after them, it calmed down again, really nasty. I was able to grab the title, even though on the final straight it felt i would stand still because of the wind coming from the front. I didn't have to wait very long for the next setback, the european championship was scheduled for France. Some circumstances were very unusual for that country which normally organises those events very well and exactly. Rumors said that this time the track-building was done by the federation, and not as usual by the hosting club. That caused the low turn with no grip. Even the gate didn't work well for me, i still have no idea, why. After all i could tick that one under experience and training. 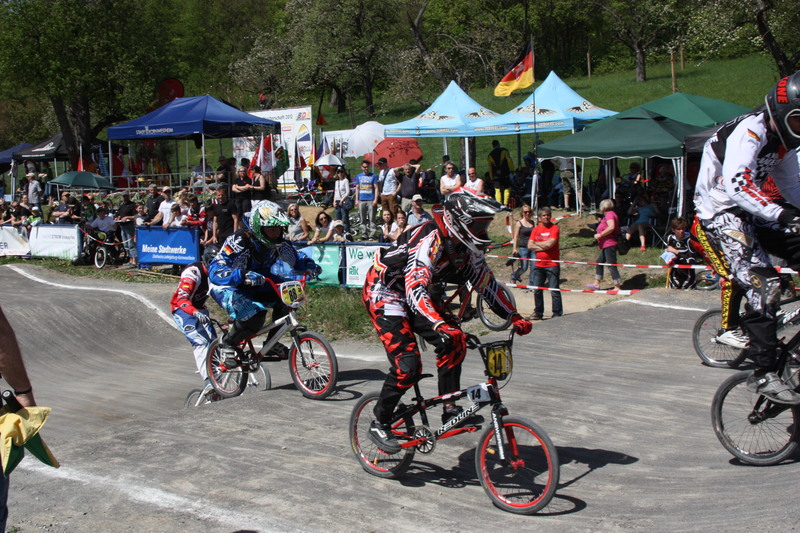 Now 2 weeks were left until the trip to Great Britain, and i could use that time very well for me, with a stamina-unit during a race at Nussdorf, among other things. Great Britain became once again a very nice and amazing experience, we met lots of kind and friendly people. Then we went to view the track. There was big amazement, because the turns were all covered with tarmac, for this 1 week only, because after the worlds the indoor arena would be cleared for other big events. This should work better than at Orléans, where several favorites went down in first place. Too bad viewing was possible from the grandstands only, i missed the opportunity of watching the track and the jumps on eye-height, because from up there the dimensions of the jumps were only hard to assess. The track was constructed nice and still challenging, only the surface was a little bit too dark, and i was not alone with that opinion. Since staging was outside the hall You came from bright sunshine into the "dark" hall. The eyes took sometimes longer to get used to that then waiting time till up to the gate. The sunday-race went well, i also jump that big step-up on the initial straight, that brought me lots of respect more than once - that motivates You even more, in particular when You realize You're still able to what You've already been; especially since the worlds came way too early for me this year. For that, 3rd place was great. After the Bundesliga-weekend in the mid of june i did a BMX-break, because i still had to go to physio for my shoulder - and thought it might be smart not to disturb all the gained positive results with BMXing. 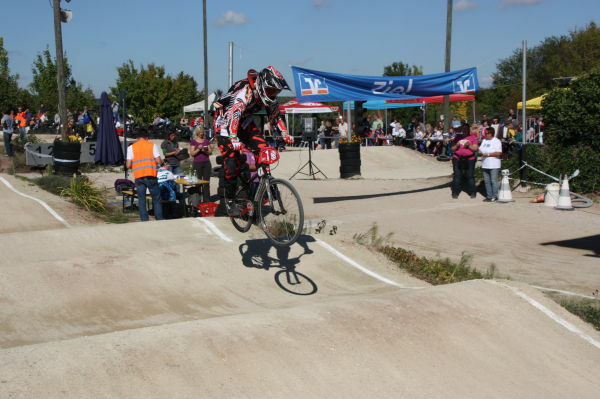 Through this, my first BMX-time was in the beginning of july on the occasion of the regional championships at Betzingen. It felt good, just as if i hadn't made that break. But of course, all the other training had been continued. 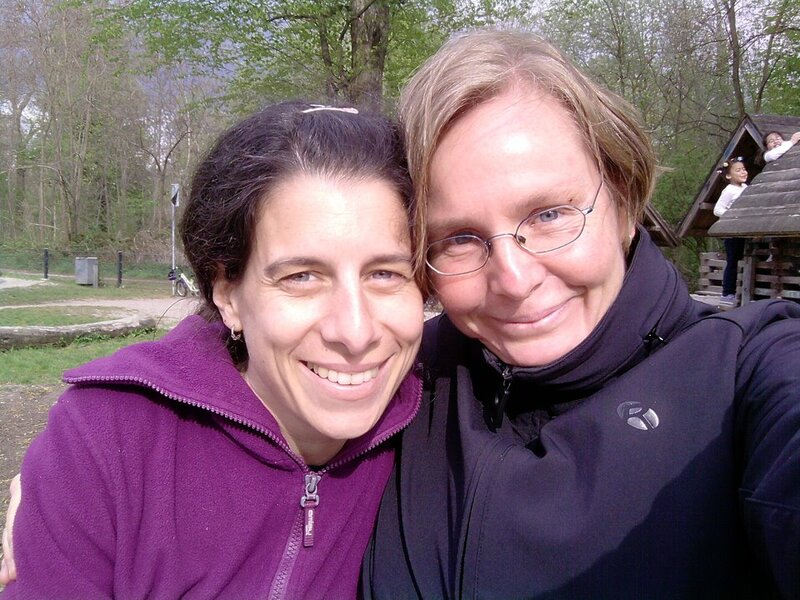 In the summerbreak my longtime friend Ines passed away after suffering serious illness, that was diagnosed in february. And that accompanied me - beside many others - since that day. Her huge loss has put everything that happened so far and all the things coming up into the shadow and made everything elso totally irrelevant. Again, life teached me another lesson, the very hardest way man can imagine - at the expense of another, so much beloved person. I am thankful for that last day with her. After that so much needed breather the last 2 Bundesliga-weekends happened in September. I had decided to compete in both classes at all races to feed my 20-inch points-account a little more. That plan went a little wrong as the second-last race was cancelled because of strong rain. Next day i recognised my body was kind of thankful for that. 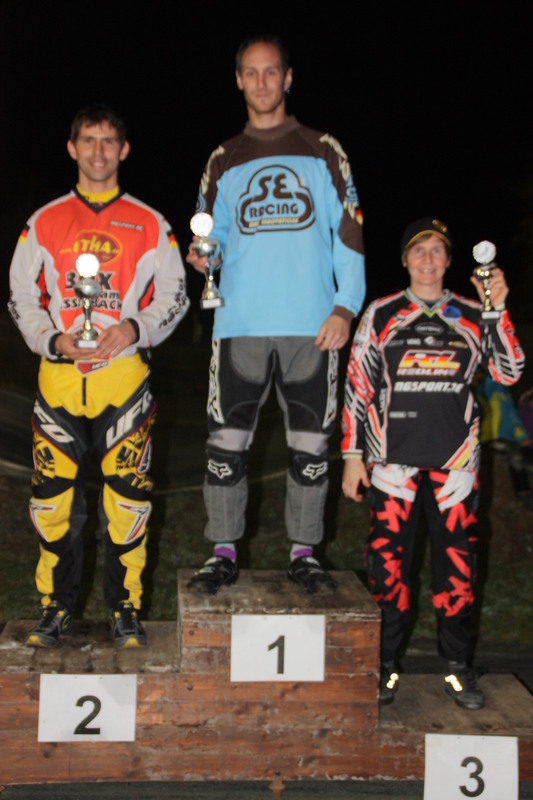 In the very last moto of the Bundesliga-season i saved myself a podium-finish that day after i did a good move in a turn. In the series it was 5th place while in Cruiser i won the series. Following i moved in "foreign waters" because we went to the Bavarian Cup to Herzogenaurach. They were happy about our appearance, and a "nice You're here" just makes a good mood and shows some recognition. This race was my last one that year in the womens cruiser-class, and even here we were not "among us", but took in a Senior 4 rider as well as a younger lady. The following BW-Cup races i "was allowed" (had to) race with the men, and at Kornwestheim we've been enough to make a main final. Don't talk about the rainy weather, my clothing looked after just one lap horrible, then it was all the same, no matter how many laps would follow. Atn Bönnigheim a totally new track was officially opened, it's been nice to have a new spot nearby. The season's finale was at the night race at Weiterstadt. And since there was lots of training-possibilities i had lots of fun riding my bike. The races were started in darkness, it was a real hightlight (even though it was very dark, i do not recommend coloured glasses), and behind the finish-line one of my competitors said: "Hey, it's fun riding with You!" What a nice compliment at the last race ! At the very last race of the year i finally found myself where i've already bee. During November we went for a nice vacation to fuel some sun and leave everything behind. It was very helpful to get some distance to everything. That was very neccessary to manage a new focussing. Insgesamt waren schon 249793 Besucher (1018097 Hits) hier!